Equatorial Guinea's flamboyant vice-president has gone trial in absentia in France on charges of corruption after he failed to stop the landmark case. Teodorin Obiang Nguema is accused of buying a mansion and sports cars in France with a fortune amassed from oil-rich Equatorial Guinea's public funds. A lawyer for Mr Obiang, the president's son, denies he is a "big-time bandit". The trial is the first since France started investigating African leaders accused of illegally acquiring wealth. It comes after a nearly decade-long campaign by anti-corruption groups demanding that France act against leaders suspected of stashing their "ill-gotten gains" in Europe. Mr Obiang's six-storey Paris villa, estimated to be worth more than $100m (£80m), is located on Avenue Foch, in one the most prestigious neighbourhoods of the French capital. It boasts a cinema, spa, hair salon and taps covered in gold leaf, AFP news agency reports. 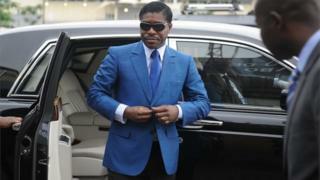 Who is Equatorial Guinea's president? Mr Obiang's lawyer, Emmanuel Marsigny, asked the court to delay the trial, saying he needed more time to prepare his client's defence. "Believe me, Mr Nguema is not a big-time bandit. He just wants his rights observed," the Associated Press news agency quotes Mr Marsigny as saying. Corruption watchdog Transparency International's lawyer William Bourdon told the court that the trial should proceed and the defence was trying to "paralyse" the judicial system through "opportunistic" and "malicious" manoeuvres, AP reports. The West African state's government launched a bid at the International Court of Justice to prevent the trial from going ahead, arguing Mr Obiang had diplomatic immunity. The United Nations' court turned down the request last month. In November, Swiss authorities seized 11 cars belonging to Mr Obiang, accusing him of money-laundering. Among them was reportedly a Porsche valued at more than $830,000 and a Bugatti Veyron which sells for $2m. In 2014, Mr Obiang agreed to surrender a Malibu mansion, a Ferrari and Michael Jackson memorabilia as part of a settlement with US authorities. The US had filed claims against his US-based assets worth more than $70m, alleging they were proceeds of corruption. Equatorial Guinea, a small country on the west coast of Africa, struck oil in 1995 but most of its population still lives in poverty. Its President, Teodoro Obiang Nguema, is Africa's longest serving leader. He seized power in 1979, and promoted his son to the post of vice-president in 2012. Mr Obiang has always said that "he earned the money legally in his country," Mr Marsigny told AFP.